Like, for instance, the waning of the moon. I was at a nightclub in Delhi with a British traveler and, partway through a Hinglish conversation with some locals we noticed the moon looked. . .squished. Horizontally. We asked our company about it. Was this common? They didn’t seem to understand what we were driving at. Them having little English, and us having fairly non-existent Hindi, we elaborated with charades. “The moon,” we started, “when it wanes. . . .does it crescent like this-” We formed our thumb and forefinger into a crescent, imitating the moon as we knew it, “-Or like this?” Using the same hand we tipped the crescent horizontally. The Indians nodded at the later. “Like this,” they replied, pointing at the hanging smile we had formed with our hands. Becca and I looked at one another incredulously. Despite knowing that the face of the moon looks different when viewed from other points on the globe, neither of us had ever thought to question that it would wane in such a drastically variant manner. At the time, we thought we might be misunderstanding the locals (a common occurrence in India or, really, in any country or conversation in which English is not the first, or even fourth, language of the person with whom you’re speaking). That, or they were pulling our leg (another common occurrence). The Flag of Mauritania suddenly makes a lot more sense. Pow. 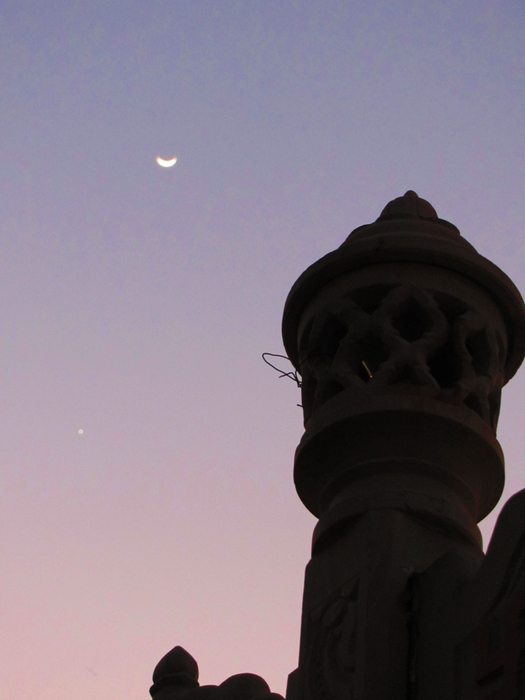 The moon hung in the sky in an undeniably horizontal crescent, looking down on me like a glowing, cheshire smile. My mind: it was blown. And while this particular instance may be more novelty than life-changing, the fact remains: If you have only ever seen something done one way, it’s easy to fall into the belief that it can only be done that way. Which, after having had a number of these illusions shattered through the years, I can say with a fair amount of confidence, is very rarely the case. The Dutch man shrugged. “Sure, if I met the right woman,” he replied. That moment’s stuck with me a long time. How certain he was that everyone wanted the American dream, the 2.5 kids and the white picket fence. How he hadn’t thought to consider that what constituted a family could mean different things to different people. It made me wonder which of my own assumptions about the desires and dreams of the global population could be equally off. What other options were out there that I’d never witnessed, and thus never considered? From relationships to religion, diet to fashion, political systems to educational structures. . .there are more options out there than you can imagine. More perspectives as well. Something you may have previously viewed as oppressive can become empowering when viewed through the right lens. Something that the society you’ve grown up in has always told you is taboo could become one of the most rewarding aspects of your life once you realize that accepting it is a possibility for you. And that can be a truly beautiful thing. It can enrich your life in a way you never thought possible. It can give you a life you never knew was an option for you. And I’m a big fan of options. This entry was posted in India, Reasons to travel, travel and tagged alternative lifestyles, India, mobile life, perspective, Reasons to travel, travel, Ukraine by Krys C. Bookmark the permalink. Love this post! Questions like this – “Why do you like to travel?” “Why are you living in a foreign country?” – are so difficult to answer on the spot, but you have given a beautiful reply: travel gives you more choices. Such an interesting answer, thanks for sharing! Thanks, Maria. I hope to get more reasons up soon.